The Sentinel user interface allows managers to schedule alarms to different personnel at different times of the day, and different days of the week. 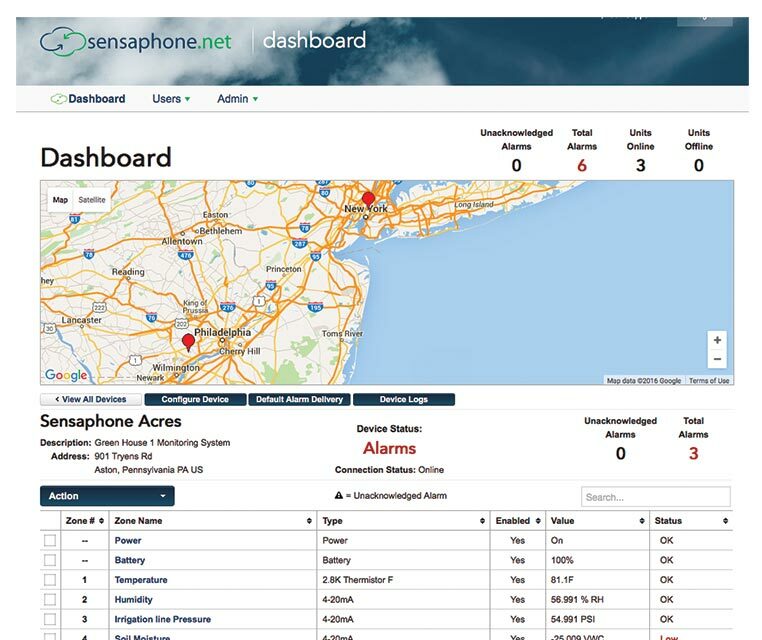 Sensaphone, a company that develops remote monitoring products for several industries, recently introduced a cellular version of its Sentinel system that could prove ideal for greenhouse operators, commercial growers, and retailers. When the Sentinel system detects problems such as temperature changes, humidity fluctuations, water leaks, and power outages, it immediately sends alerts by phone, text, or email over standard cellular networks. The instant notification allows personnel to take corrective action, save critical assets, and quickly address a potentially costly situation. Only one Sentinel unit is required to monitor up to 12 different environmental and equipment status conditions. The Sentinel system stores all sensor readings in the cloud, which provides unlimited information storage and protects against data loss. Multiple devices can be managed from one account using web-based management tools. No software is required, so installation, integration, and management of the system are fast and easy. The Sentinel system’s enhanced data-logging capabilities allow users to print, graph, or export event reports daily via email, providing an audit trail of all user data activities. Sensaphone also offers an ethernet-based model. 1. Flexible communication methods. The Sentinel can use a standard ethernet connection, Wi-Fi, or cellular connection to communicate its data and send alarms. You’re not limited to just one. There are no people involved; simply plug it in to a live Internet connection, and it starts working. All the data is sent to cloud servers, where users access it by creating a free account to manage their devices. 2. Manage multiple devices. Add as many devices to an account as needed. Sensaphone currently has customers who have hundreds of devices on one account. Data from each device can be viewed from one dashboard. 3. Self monitoring. The Sentinel monitors its Internet connection and will alert users if the device is unable to communicate to the cloud. This provides peace of mind that the device is always up and monitoring. 4. Alarm scheduling and escalations. The Sentinel user interface allows managers to schedule alarms to different personnel at different times of the day, and different days of the week. If a greenhouse has a lot of employees, they can schedule the appropriate personnel to get the proper alarms. There are also different permissions, so the manager can allow users to log in and view status without giving admin permissions. 5. Mobile app. Users can conveniently check the status of devices from a phone or tablet. 8. Flexible alarm delivery options. Whether it’s a text, a phone call, or an email, the Sentinel can deliver all three options.